There can be too much of a good thing. Almost every week I had been making Mushroom Risotto. Ed and I would have some for dinner with a salad, skip a night and have the same menu again, skip a night and have the rest of the risotto with Brussels sprouts and roasted winter squash, more veggies than risotto. One night I had only enough mushrooms to make half a recipe of risotto and was ready for a change so I used most of the same ingredients but pasta instead of rice. The key ingredient here in addition to the mushrooms is olive oil and garlic, the garlic cooked until it is crunchy golden brown. Start water for pasta and then cook pasta, according to manufacturer's instructions so pasta and sauce are ready at approximately the same time. Alternatively for more flexibility sauce can be made and then just rewarmed a bit before serving. The Goat Cheese, Fig, Arugula, and Prosciutto Tapas made me think of three of my favorite recipes: Pollo Rellano, Chicken Stuffed with Spinach, Goat Cheese and Mushrooms, and Goat Cheese Stuffed Chicken Breast with Red Chili Mole, and the possibility of a fourth favorite in this category. Tried this stuffed chicken breast variation and was not disappointed. The first two favorites are panko/breadcrumb covered and baked while the third is pan fried. The first few times I made this recipe I dipped the chicken in egg then bread crumbs and baked. Excellent. Now one of "four favorites". Then I was looking for a recipe for a "hearty lunch". First recipe that came to mind was Seafood Gumbo, but I'd already served this to the intended guests. Why not pan fry (we use cast iron skillet on grille), slice and serve on a large platter on a bed of arugula along with crusty bread - sort of a chicken sandwich on steroids. Very well received. Recipe is for 2 - 3 (if larger breast and sliced), scale accordingly. Fold the top of each breast over the filling and secure closure with toothpick if necessary. Place on oiled baking sheet and lightly spray with olive oil. Bake for approximately 30 minutes (for a medium sized breast) until the chicken is cooked through and opaque (~160 degrees F) and the bread crumbs are browned. Serve whole, or, particularly if larger breasts are used, slice crosswise into 3/4 - 1 inch wide pieces. When oil is hot, place the chicken breasts in the skillet and cook approximately 6 minutes on a side (longer if breast pieces are more than 6 oz each) until both sides are browned and chicken is cooked through (and temperature is ~160 degrees F). This hors d-oeuvre comes from a late night sandwich that Alex and Dan had in Tarragona, Spain in 2014. They along with Henry (then 3 months old) after several tries,finally found a hotel. It was late so Dan went out for sandwiches and came back with one they particularly liked. Based on the ingredients they subsequently made tapas for a party. What follows is the recipe they kindly shared with me. Trader Joe's is a one stop source for all the ingredients (though bread availability may vary) and their fig butter is excellent. Return to the source and use same ingredients to make a sandwich. This red, white and green dish is perfect for the Christmas season. I must admit I had not planned it that way. Turns out I had a lot of leftover turkey and it was pretty dry. First I made a big batch of turkey soup, then what? I thought of two of my favorite recipes Butternut Squash Enchiladas and Goat Cheese Stuffed Chicken Breast with Red Chili Mole. Dinner was underway. Easy dinner for me because I had some mole sauce in the freezer. NOTE: While a great way to use leftover turkey, this recipe would work equally well or better with chicken. Mix, then gradually add 1 1/2 c water. Return to the stove and bring to a boil, stirring slowly but constantly so that the chili doesn't burn. It will thicken as it cooks; add an additional 1/4 c water to thin it out if necessary. 1 oz Mexican chocolate. such as Ibarra, coarsley chopped [I use 1 oz unsweetened chocolate plus 1/2 t ground cinnamon or 3 T baking cocoa plus 1/2 t ground cinnamon]. Mole recipe makes about 2 cups, If not all used, it can be frozen for future use. Toss the squash cubes in olive oil and bake for about 10 minutes until tender. Reduce oven to 350 degrees F.
1 1/2 - 2 oz. crumbled goat cheese, divided 4 ways. Bake in 350 degree F oven for 12 minutes. Arugula or other greens that are good warm. * I keep chopped cilantro in the freezer. The frozen cilantro sprinkled directly on the enchiladas (shown in photo) also works well. Butter two 9-inch cake pans. Line pans with parchment paper and butter parchment paper. Divide the batter between the two cake pans and gently tap pans to remove any air bubbles. 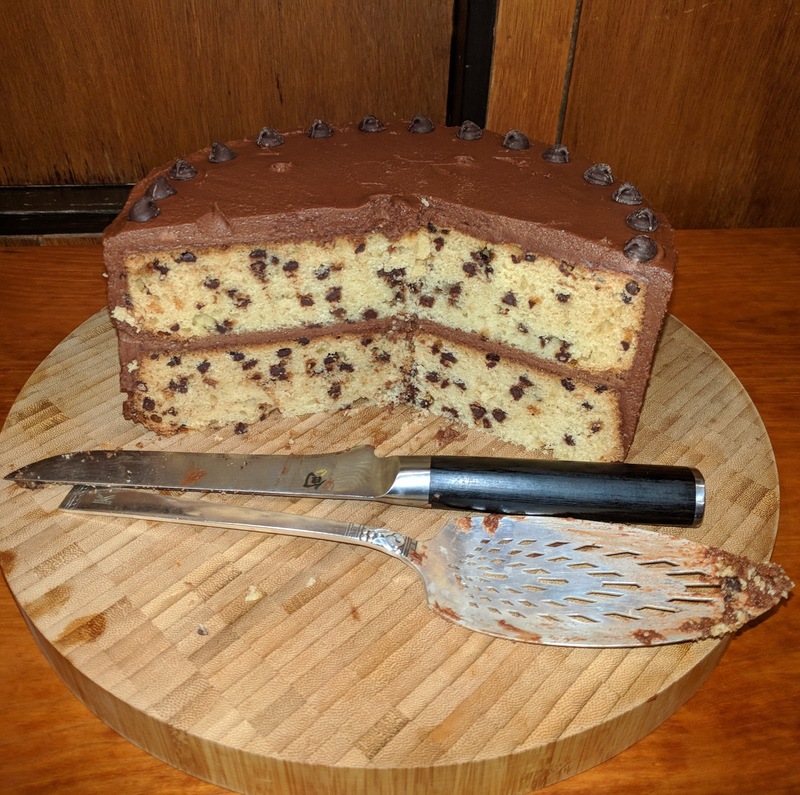 Bake 35 to 40 minutes or until a small skewer inserted in the cake comes out free of batter. Cake should be golden brown. Cool in pan for 10-15 minutes then remove to a rack.Cool completely before frosting. * In lieu of buttermilk, mix 2 T vinegar with enough milk to measure 2 c and let sit five minutes before using. Reduce heat to low and stir, about 6 minutes until the sugar melts completely and the mixture slightly thickens. Put the bowl with the cream - chocolate mixture inside a larger bowl which has a layer of ice cubes on the bottom. 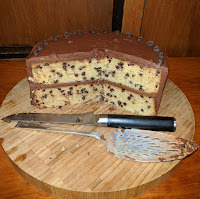 Using a stand or upright mixer, beat the mixture until it is thick and glossy, scraping down to sides of the bowl frequently so that the mixture is fully mixed. Frost the top of the lower layer then place the second layer on top. Frost the top and the sides of the cake. 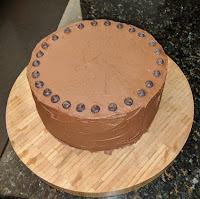 Decorate the top as desired with chocolate chips. 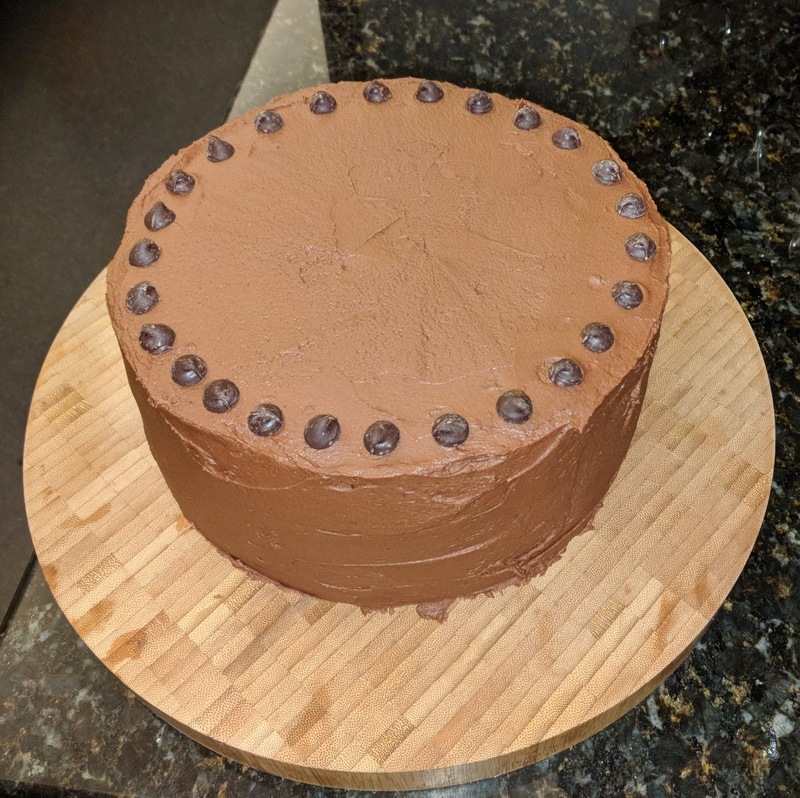 Alex placed a circle of chocolate chips around the perimiter with birthday decorations in the center and served the cake on the same wooden plate that had held her and Dan's wedding cake. As of Thanksgiving 2016, I could count on one hand the number of turkeys I had cooked, the last one in 2008 and the one before that a very long time ago. I've done Almonds, Cranberry Ice, and Creamed Onions most every year, an occasional Pumpkin or Pecan Pie (Chris and Alex now do the pies!) but seldom a turkey. When I was a small child and we had Thanksgiving dinner as the noon meal, I heard my Mom say she had to get up really early to "dress the turkey". Helpful child that I was, I got up even earlier and somehow managed to get the turkey out of the refrigerator (no cryovac bags in thoses days - Mom had already spent hours removing all the pinfeathers), and carefully "dressed" it with Kleenex. Last year's (2016) attempt was only a little more successful. I got a rather large turkey, about 18 pounds I think, and used a recipe, How to Cook a Perfect Thanksgiving Turkey I found in the Boston Globe. Think the failure was not caused by the recipe but (1) cooking the turkey closer to 180 degrees at the inner thigh, as I do with roast chicken, and perhaps buying too big a bird. Ihe gravy makers objected to the lemons, put per recipe in the water under the turkey. Think fresh herbs were a waste, as they did not stick as well as dried herbes d' Provence. Herbs were the least of the problem though as the white meat was very dry. Lessons learned: Do not wash turkey. Turkey is done at 165 not 180. Don't mess to much with the "gravy base". Soon after this turkey disaster I saw a recipe in the New York Times, How to Roast a Turkey. I filed it forThanaksgiving 2017. When I was debating what size turkey to get that year Chris responded, I don't care about the size just don't have it dry like last year. This sent me to an on-line search as to what causes roast turkey to be dry. I found many references to size. Apparently the larger the turkey, the harder to cook well, especially without a wet brine. Many sources suggest cooking two 10 or 12 pound turkeys rather than one 20 to 24 pound bird. I then returned to Melissa Clark's NYT recipe, again front page and center in the New York Times. Interestingly her recipe is for a 10 to 12 pound turkey and she uses a dry brine. I basically used this technique, leaving out some things (lemon zest, lemon quarters, cider and wine so as not to impact the gravy) and doing my own herb blend. Put turkey with herbs and garlic in a 2-gallon zip-lock bag. Seal, put in second plastic bag, and place on a rimmed baking sheet in the refrigerator. Turn bird over every 12 hours. Remove turkey from zip-lock bag and pat dry inside and out with paper towels. Return to the refrigerator, uncovered on the baking sheet, for at least 4 and up to 12 hours. This helps to crisp it. Again maybe not so important if not planning to eat skin. Remove turkey from refrigerator one hour before cooking. Tie legs together with twine. Place turkey, breast side up, on a rack inside the roasting pan. Roast for 30 minutes then cover the turkey with aluminum foil. Reduce the oven temperature to 350 degrees F and continue roasting until as instant read thermometer inserted in the thickest part of the thigh reads 165 degrees F. About 1 1/2 to 2 hours more. Transfer the turkey to a platter and let rest for 30 minutes before carving. THERMOMETER Lesson learned: Have an accurate, calibrated thermometer. Chris once pointed out to me that it is ironic that we pay more for the meat we are cooking (each time) than for the thermometer (one time). The remote thermometer I used seemed to calibrate well in boiling water but must not have been positioned correctly as it read 165 degrees F after a little less than 2 hours total cooking. I took the foil off and checked with an instant read thermometer and the bird still had 10 degrees to go in spots and the Bell and Evans pop-up thermometer had not popped. After opening (and cooling) the oven for several temperature checks I ended up cooking the bird 30 minutes at 450 degrees F and 2 hours and 45 minutes at 350 degrees F (or less as oven cooled with each opening. The built-in thermometer had not popped when I removed the turkey from the oven but did in the half hour while the turkey was resting. I think next year if I get a 12 pound turkey, I will plan on 1/2 hour at 450 degrees F and 2 hours at 350 degrees F My day was made with Chris messaged me he was safely home and then, when I thanked him for the pecan and apples pies he brought he replied, "Thanks for the turkey. You cooked it perfectly!" AVOCADO TOAST – Avocado topped with salt, pepper, and olive oil on choice of housemade bread . Missed this on the menu because it is actually a breakfast offering (thinking now of the avocadoes offered for breakfst during a trip to Costa Rica), but also available for lunch. Yum! Why didn't I think of this? So delicious and easy to make. Recently, I had a box of fresh basil from Chris's indoor garden, a loaf of Dave's Killer Bread, which I had bought on reccomendations posted on our town "link", and of course, avocadoes, so I improvised accordingly. 1 large slice of bread. Arrange sliced avocado on toasted bread. Silce in half. Enjoy for breakfast and lunch!